I’ll bet you didn’t know that pumpkins purchased in October to be used for autumn decor will last until past the end of February! Don’t ask me how I know that. I’m a little embarrassed to admit that my family has been enjoying a beautiful assortment of Thanksgiving pumpkins, Christmas pumpkins, New Year’s pumpkins, and Valentine’s Day pumpkins. Enough was finally enough. I was ready to take my pumpkin to the next level. 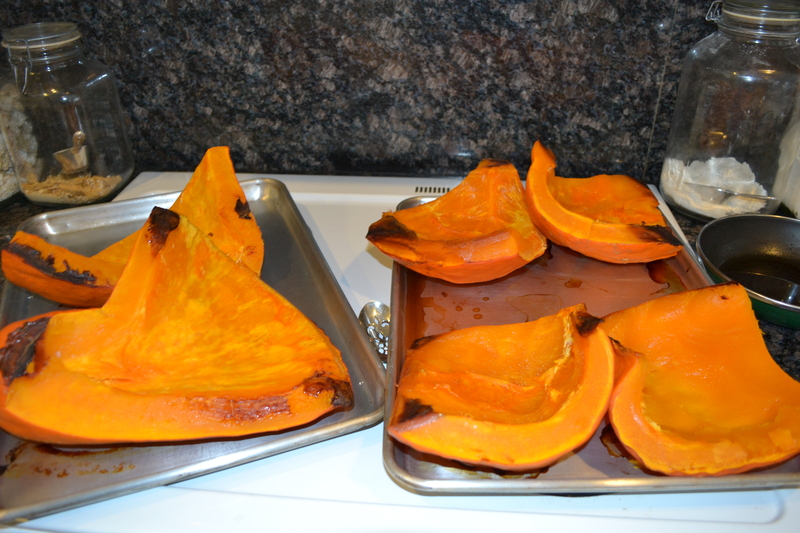 Roasted pumpkin is part of my recipe repertoire with pumpkin empanadas, elegant creamy pumpkin soup with pepitas, pumpkin creme brulee, pumpkin waffles, pumpkin biscuits. Did you guess that I’m a fan? Just for the record, pumpkins, when kept relatively cool and dry last a long damned time. The flesh can then be roasted, packaged, and frozen in zip-locked bags with relatively little work. 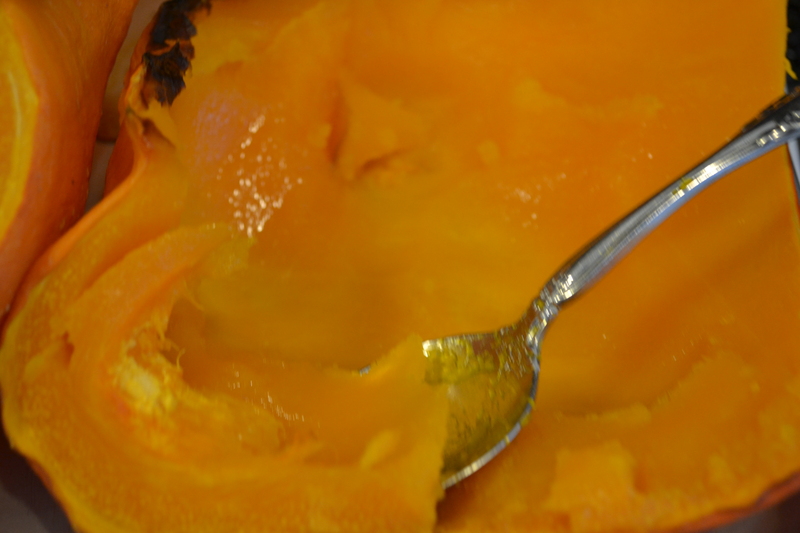 Depending on the size of the pumpkin, take a large butcher knife or extra long, serrated bread knife to cut through. Use a spoon to scrape out seeds and stringy bits. Cut again to fit onto a cookie sheet. Arrange, skin side up on the cookie sheet. Place in a 400° oven until the skin begins to wrinkle and a fork inserts easily into the flesh. After roasting, these pumpkin bits have been flipped over to cool before scraping the flesh from the skin. 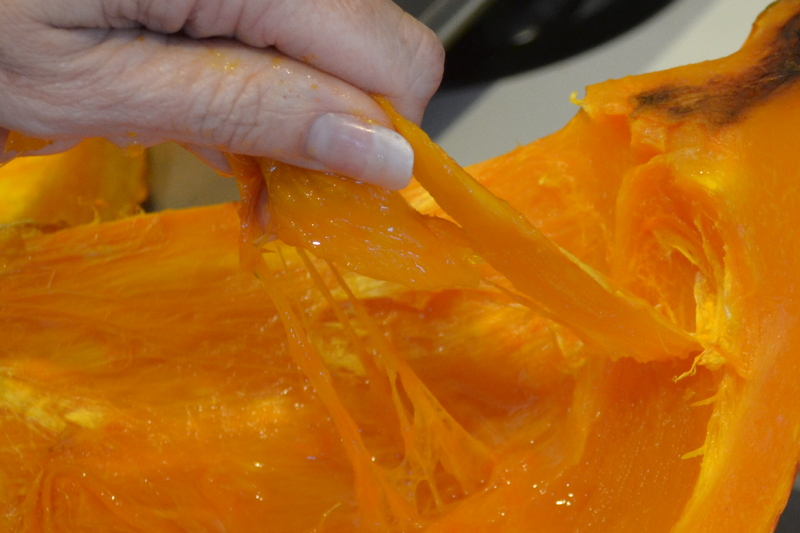 Additional stringy bits can be removed easily once it has been roasted. The roasted flesh can easily be scooped out of the skin. 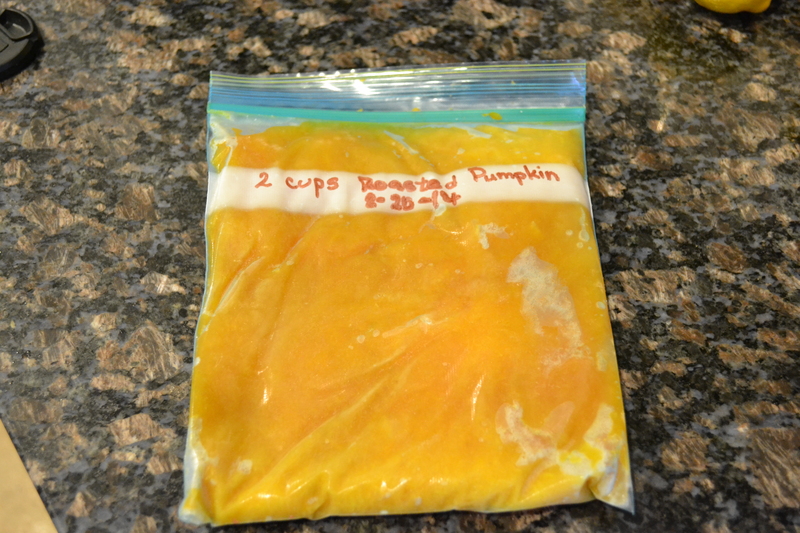 I always transfer the roasted pumpkin into a 2-cup measure before transferring it to a zip-lock bag and labeling it. Labeling the package with the contents, amount, and date is helpful when pulling from the freezer for a recipe. Flattening out the contents before freezing allows for easy storage. 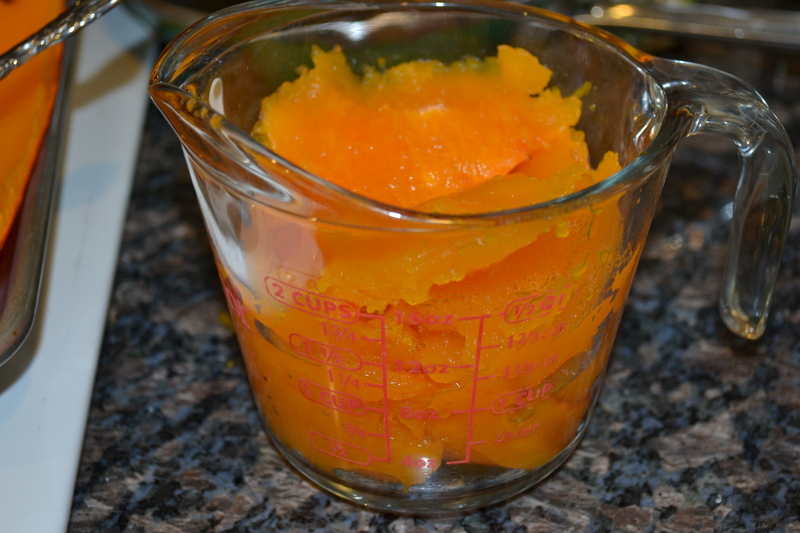 Freeze flat on a cookie sheet then stack after contents are frozen. That prevents bags from sticking together during freezing. I set aside a little to make this wonderful batch of empanadas. I didn’t know that pumpkins lasted so long. I keep them in the fridge and it takes up so much room. 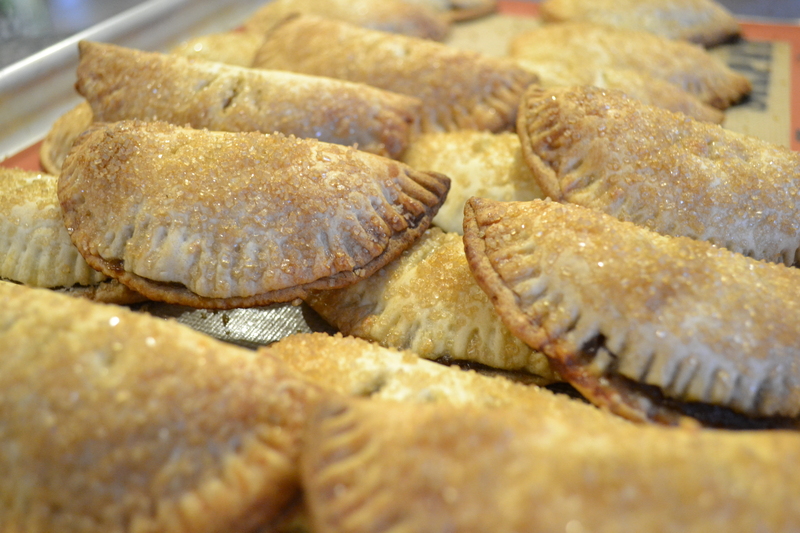 A bakery near me makes pumpkin hand pies that look a lot like empanadas with puff pastry. Really simple but yummy. 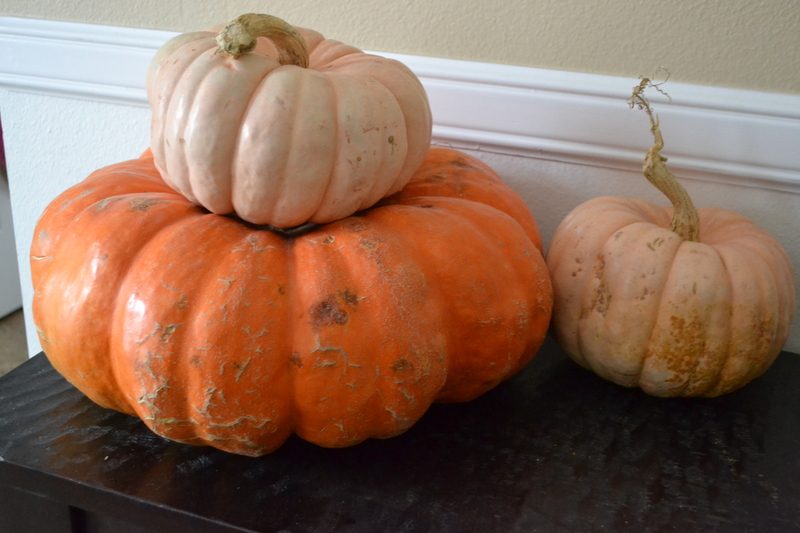 Yeah, even in the very humid environs of South Texas, pumpkins will last for 5-7 months. Some varieties last longer than others. Small pie (sugar) pumpkins don’t last nearly as long as the lumina, Jarrahdale, or Cinderella even though these varieties are beautiful and great when roasted.